A common thread throughout all of BCG's simulation systems (MaST, PCS-3XX, PCRadar, etc.) are the database files used to establish the exercise training area. BCG database files are created using custom designed software that reads and interprets ENC/S-57, DNC, or CMAP data for its source information. These new database files represent not only 'fresher' data than paper chart versions, but the radar image also correlates more closely with ECDIS chart presentations that utilize the same or similar data for their presentation. BCG still maintains the policy of creating and selling radar databases for our customers. Our normal turn around time is 2-3 weeks after receipt of order. As customers use the BCG family of simulators, there may be a need for additional training areas (databases). Each port visited by a ship becomes a potential training area for the mariners aboard that vessel. 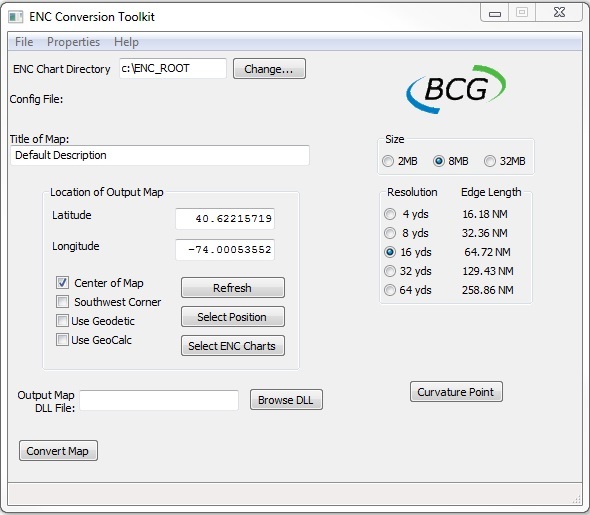 As an option to our simulator product line, BCG now offers our Radar Landmass Database Generator (RLDG) Workstation to support this need. The Radar Landmass Database Generator Workstation allows the operator to create a radar database for a specific geographical area he or she wishes to train in and do so directly from unencrypted ENC-S-57, DNC, or CMAP data. Once the radar image is created by the RLDG, the operator will have the capability to customize the radar image to meet the exact training needs. The final database files can then be distributed to any BCG radar emulator, the PCS-3XX, or PCS-100VMS simulator used by our customers. NOTE: For US Government customers BCG offers a software package that uses DNC data for database creation. Contact BCG for more information on this capability.